I just don’t know how she does it! 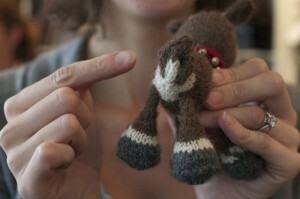 I feel like there is a new and even more adorable toy at Urban Yarns every week. Not only is Amanda on a Toy roll but they have been popping up at knit night, knit classes, and in general show and tell. 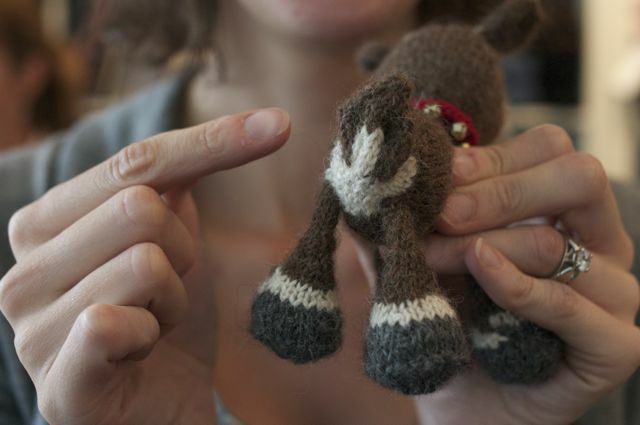 Anina just finished knitting this adorable turkey from the Spud and Chloe Blog. It’s a free pattern that you can find here. 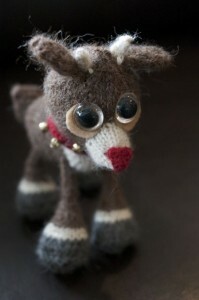 My new favorite though is the cutest reindeer of all! It may seem a bit early to be getting so festive but I just think he’s the cutest thing. Amanda knit this little lovely up with Blue Sky Alpacas yarn (sumptuous) and the pattern and bits and pieces from CID designs. There are so many to choose from in this line (even Amanda hasn’t knit them ALL yet), there is a cute elf and santa if you are feeling festive, or drop by and check out the frog prince. Amanda knit him up in a tweedy yarn and he’s just perfect. The menagerie continues to grow! The only problem with these charming little creatures is that they can seem a little daunting. Small double pointed needles, lots of increases and decreases, putting the whole thing together when it’s done…it can seem like a lot to take on in a small project. This, however, is both the challenge and the charm of toys. There is a lot of interest and technique but there is also a lot of instant gratification. Also, should a mistake HAPPEN to turn up, it’s not a lot of knitting to rip back (perish the thought). If you are still feeling overwhelmed at the possibility of a little toy, don’t be afraid, just learn from the best! Amanda is teaching a class on the CID Hanscom Design kits at the end of the month. This whimsical class is going to be a lot of fun, using the ever-so-cute, CID Hanscom Design Kits. THere are a number of sweet creatures to choose from: Harry Rabbit, Squeak the mouse, Tadeus Crocker, Croco Dehlia to name a few. Amanda will assist you in working through the pattern and help you with its final construction. Supply Requirements: Suggested yarn is Blue Sky Alpaca Sport or Melange & 2.25mm needles, fibre fill. *Please Note: Since these toys are fairly small, basic knitting skills are a pre-requisite, with a concentration on fine motor skills. This entry was posted on Thursday, October 7th, 2010 at 6:24 pm	and is filed under Uncategorized. You can follow any responses to this entry through the RSS 2.0 feed. Both comments and pings are currently closed. Are you selling the patterns in the shop if you don’t want to take the class? You bet! The patterns come in a kit with the eyes and other little do dads to finish up the little wonders.